Selected from the best naturally wind dried grapes, the raisins are rich in dietary fibre, carbohydrates with a low glycemic index, minerals, vitamins and other micronutrients. Cholesterol-free, low in sodium and fat, it is a perfect choice to eat Green Raisins as a nutritious snack or for bakery purpose. 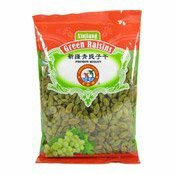 Simply enter your details below and we will send you an e-mail when “Xinjiang Green Raisins (兄弟 青提子乾)” is back in stock!